The use of dolls can bring great benefit to some people with a diagnosis of dementia, particularly those in later stages. It involves making a doll available to the person to hold or to sit with. What are the benefits for people with dementia? Some people with dementia find that they get enjoyment from holding or simply being with a doll. It might remind them of a time when they had young children of their own or simply create pleasant feelings of reminiscence or affection. Some family members find that giving the person they care for a doll seems to inspire a renewed sense of purpose, which can lead to increased activity levels and liveliness. Having a doll to interact with can improve the person’s communication, which can produce improvements in communication with other people. • Introduce the doll gradually. You could place it on a chair before the person enters the room. Watch to see how – and if – they respond. • Let the person discover the doll in their own time. If they show no interest in it, do not worry too much about drawing their attention to it. You can always try another day. • If the person with dementia is interested in the doll, use it as a way to connect with them. If they aren’t able to answer questions about the doll, consider making observations about it to them instead, for example: ‘what a nice face’, ‘what a lovely dress’ etc. • Not everyone will want to interact with a doll. If the person shows no interest, do not press the doll upon them. • Some people dislike seeing the person they care for with a doll or toy. They may think it seems like they are treating them like a child. Discuss your plans with any other members of your family first to discover their views. Explaining the benefits and the evidence may help soothe any concerns. 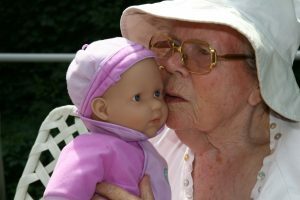 • Some people with dementia may become very attached to a doll. Grandchildren or other residents in a care home may pick up the doll which could prove upsetting. Consider using the doll at times when this is unlikely to happen. • The person may start neglecting their own needs to prioritise the doll, for instance, putting it in their bed while they sleep in a chair, or trying to give it their food. Watch for these signs of attachment and consider using the doll away from meal times and early in the day rather than close to bedtime. • Be culturally sensitive – consider choosing a doll with the same skin colour as the person. • Try to avoid using dolls that make a noise e.g. crying noises, as this may cause distress. • Some people might prefer a cuddly toy or animal so you can try making these available too and allow the person to choose.